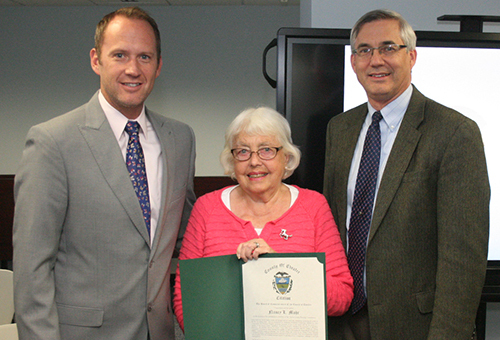 The Planning Commission recognized Nancy Mohr for dedicated public service to her county for over a quarter of a century at their October 12th public meeting. Nancy served on the Chester County Planning Commission from 1998-2016 where she helped develop and promote Landscapes2, the County’s comprehensive plan, and sat on the Vision Partnership Program sub-committee where she evaluated municipal requests for planning services which implements Landscapes at the local municipal level. In addition to volunteering on the Planning Commission, Nancy sat on the County’s Agricultural Land Preservation Board from 1997-2007. She was also instrumental in establishing Brandywine Conservancy’s Headwaters Area Conservation and Easement Program that has protected thousands of acres in the county. She also served as the executive director of the Chester County 2020 and partnered with the County on holding Community Conversations, Keep Farming First summits, as well as developing the Master Planner Program for training community leaders in planning. The Planning Commission appreciates her dedication in making a difference in the quality of life we all enjoy for generations to come.